What sparks creativity and invention? See Larry's half hour Interview about his book MegaMinds: Creativity and Invention at the Consumer Electronics Show (CES) in Las Vegas, January 7, 2016. My guest blog in HuffPost. See my guest blog about the pros and cons of patents vs trademarks on IPWatchdog. This high-impact book explores how people think creatively and motivates the reader to be creative and inventive. 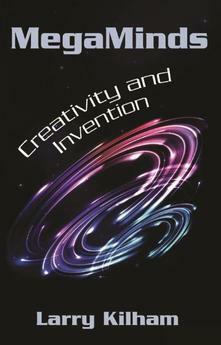 Larry Kilham reviews the major creative epochs and thinkers such as Leonardo da Vinci, Thomas Edison, and Albert Einstein and then moves on to the latest in computer-aided thinking. Noting that we are entering an era where the lone genius may no longer be equal to solving complex problems such as climate change and pharmacology, Kilham proposes new approaches combining the best of the imagination, creative thinking, collective intelligence, and the Internet. The book order site is here. Ever wonder how to invent and to build a business? Here’s how! 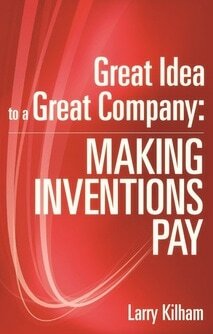 Great Idea to a Great Companytakes the reader through the essential steps of building a successful company. Included are such topics as forming a vision, creating a product, formulating a business plan, the basics of marketing (including a special chapter on small business web marketing), finance, production, patents and all the elements, formal and informal, that pull the whole process together. All major points are illustrated by examples drawn from the author's and his family's invention-based companies. 1 - Creative visionary is somebody who is persistent and has a multifaceted mind. 2 - Every successful project or company starts with a creative visionary. 3 - You should notice all things, however unrelated to your quest they may seem. 4 - Unleash your curiosity, quest for knowledge, and propensity for noticing things. 5 - Project your mind into imagination space, focusing on all the interrelated aspects of what you are creating. 6 - Emotion is part of the creative formula. 7 - To create your Eureka moment, you must move your mind beyond the existing thinking about the subject. 8 - You must try to move out of your conscious world and focus your mind in a new place occupied only by the creation. 9 - Bring in experts and specialists whenever and wherever appropriate. 10 -A common mistake is to be overly protective about your novel idea. 11 - Focus on the practical, useful, needed and beautiful. 12 - Be persistent. Don’t give up! 13 - Project your mind to a special little world encompassed by this project you are creating. 14 - Much more information is stored in our unconscious mind than our conscious mind. 15 - In the intensive imagination and invention process, the unconscious memory is searched for clues and ideas. 16 - Thinking in pictures and images is another approach to imagination. 17 -Times of tension and danger often seem to foster creative and inventive efforts. 18 - Imagination opens your room to fresh air, bright outdoor light and new ideas. 19 - Creativity and innovation are the way out to new frontiers. 20 - Education is the basic force for insuring productive change from generation to generation. 21 - We must inculcate the value and methods of good research in our student population. 22 - Without the sense of importance of empirical truth, the relevance of reality is lost and progress is stalled. 23 - It is important for children to be interested in creative accomplishments at an early age. 24 - Many people feel a sense of “Why bother?” because it appears that the world has run out of possibilities. 25 - Times of insight and creativity come and go with the ebb and flow of unexploited knowledge. 26 - The world can benefit from the combination of all the bright new minds coming up through the educational systems. 27 - People must see that the universe is available to them. 28 - Children should realize that there is an infinite future for them. 29 - Creativity has never been more important than now.